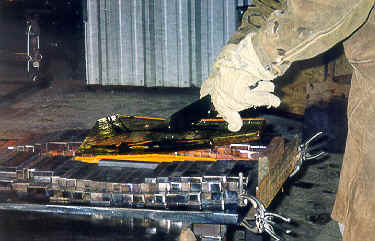 The molds for the Flames are made of hundreds of individual pieces of steel that are arranged on a hot marver. 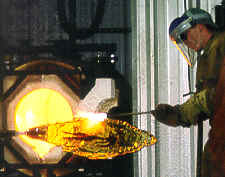 After the first ladle has been poured into the mold, the inclusion with the images is laid into the pattern and covered with more glass (example). 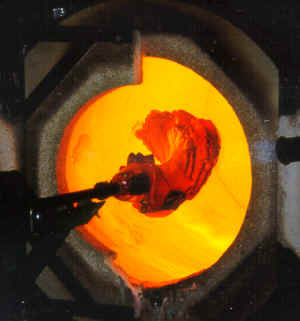 Once the casting is on the punty it is re-heated and the cracks are fused and healed. After more re-heats I sift powdered glass onto the edges and sides of the piece, being careful not to obscure the interior images (example). When I am satisfied with the color application, I heat the piece until it becomes very floppy. I use the natural tendencies of the material to help give the piece it's final shape. Especially on the larger pieces this can be quite a challenge. It is like having a 3 foot long, 50 lb. fish at the end of a 6 foot spear (example). Peter Gard, Henner Schroder When the piece is done, we crack it off the pipe and place it into the annealer.